The Cleveland Clinic states that you can halt numerous digestive issues with dietary changes, and recommends that you get a sufficient quantity of fruits, vegetables and fiber in your diet. The clinic lists the avocado as a food to incorporate into your diet, as it offers a wealth of vitamins, minerals and healthy fat. 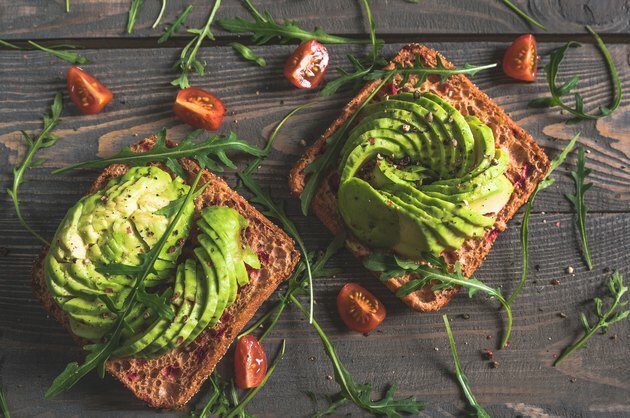 The avocado is a versatile food and you can easily add it to a variety of meals and snacks such as salads, sandwiches, pastas and salad dressings. One half of an avocado contains 4 grams of fiber, which is 11 percent of the recommended dietary allowance for men and 16 percent of the recommended dietary allowance for women. Dietary fiber is essential for your diet, as consuming it alleviates a host of digestive disorders, according to the University of Maryland Medical center. Fiber enables food to move faster through your intestines, and also absorbs water to help prevent constipation. Additionally, fiber helps prevent the recurrence of inflammatory bowel disease and slows the progression of diverticulitis, which is a condition in which small pouches on your intestines become inflamed. One half of an avocado contains 345 milligrams of potassium, which is 7 percent of the RDA for adult men and women. Potassium is necessary for your system, as it helps regulate fluid in your body. A potassium deficiency is characterized by intestinal paralysis, according to the Linus Pauling Institute. Intestinal paralysis results in bloating, constipation and abdominal pain. Avocados are rich in energy-boosting B vitamins. All of the B-complex vitamins help you metabolize carbohydrates from food into energy. They also assist you in using fats and proteins and in maintaining a normal appetite. A deficiency in certain B-vitamins can cause digestive issues. For example, a folate deficiency can cause diarrhea and a niacin deficiency can result in pellagra, which is a disease characterized by diarrhea. One half of an avocado contains 60 micrograms -- or 15 percent -- of the RDA for folate and 1 milligram of niacin -- or 6 percent of the RDA for adult men and 7 percent of the RDA for adult women. Your body requires magnesium to initiate a chemical reaction that metabolizes proteins and fats. Magnesium activates adenosine tri-phosphate, which is a molecule that provides energy for all of your metabolic processes. It also helps move calcium and potassium across cell membranes so that your muscles -- including the digestive muscles -- can contract. One half of an avocado contains 19 milligrams of magnesium, or 4 percent of the RDA for adult men and 6 percent of the RDA for adult women 31 years and older. The vitamin C in avocados helps you make collagen. Collagen is a protein that you need to manufacture skin, cartilage, ligaments and tendons. Collagen also wraps around your intestinal walls, giving your walls strength to do their job. One half of an avocado has 6 milligrams of vitamin C, which is 6 percent of the RDA for adult men and 8 percent of the RDA for adult women.